I am not a proficient developer. In fact, I find code scary. I can be dangerous with HTML, CSS, Python, and I’ve even been known to toy with VisualBASIC and C# in the past but one thing I don’t call myself is a developer. This is important to note because when I first looked at this I naturally assumed it would be technically complex, time-consuming, and require a PhD in machine learning. As you’ll see, it doesn’t. I’m expecting to update this post several times with more context and detail. When I built the chatbot I didn’t have writing a blog post in mind and therefore didn’t write out the steps or take screenshots. Since a few people have asked how I did it, I’m writing it up. There may be gaps, and if there are please let me know in the comments. Lastly, the chatbot I’ve built is rudimentary. It’s awesome and fully working, but to take it to the next level I can see the need to start adding some custom code and development. I provide what I did here purely “as-is” to help you get started. I needed a purpose to build a chatbot, and since I’m often asked fairly simple and common questions and am often setting an “OOF” (Out of Office) response I thought that a “virtual James” that people could ask questions of would be a great proof of concept and might even help keep my inbox manageable whilst I’m out with customers and partners. Skype - as a contact you chat within the client. Microsoft Teams - as a bot you chat with via the web or desktop app. Web chat - a simple web portal chat interface. It’s actually very simple to support channels like FaceBook Messenger, Slack, Telegram and even services like Twilio but I haven’t activated those for now. An Azure subscription. Don't worry if you don't have one, you can get £150 of free credit by signing up for a trial. Questions. This isn't strictly required, but if you have a bunch of URLs to FAQ pages it's very easy to train the chatbot on those questions automatically. As you'll see, you can add your own but a pre-existing bank of "question and answer pairs" can save some time. Refreshments. Diet Coke is my preference, but grab yourself a drink. Create the initial Q&A bot using QnA Maker. Train the Bot with pre-existing FAQs and customer questions, and we'll test to make sure they're being answered correctly. 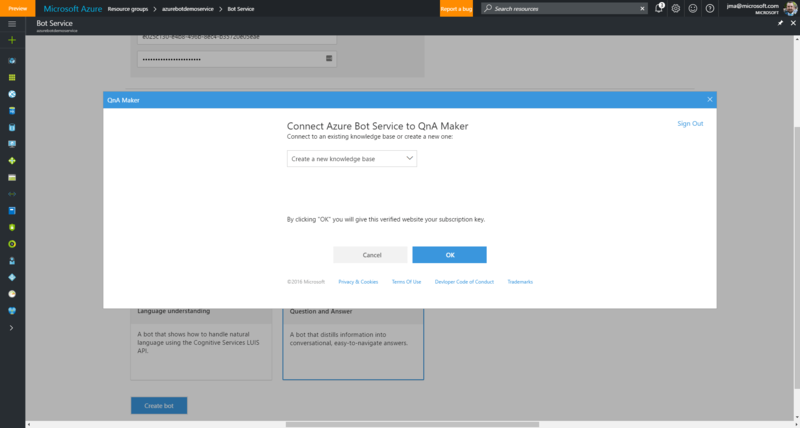 Create a Bot using the Azure Bot Service (in preview), to which we'll hook up the Q&A chatbot we just made. 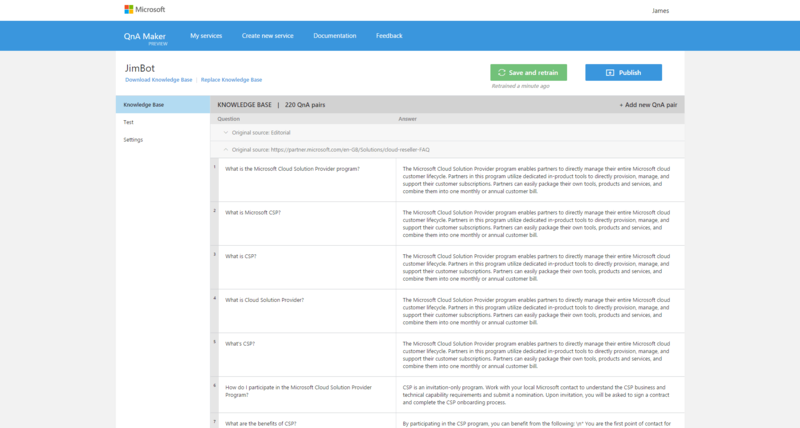 Configure the Azure Bot Service and Q&A Bot to work together, it's a few clicks and some copy-and-paste. Configure Channels for the chatbot to be interacted with. 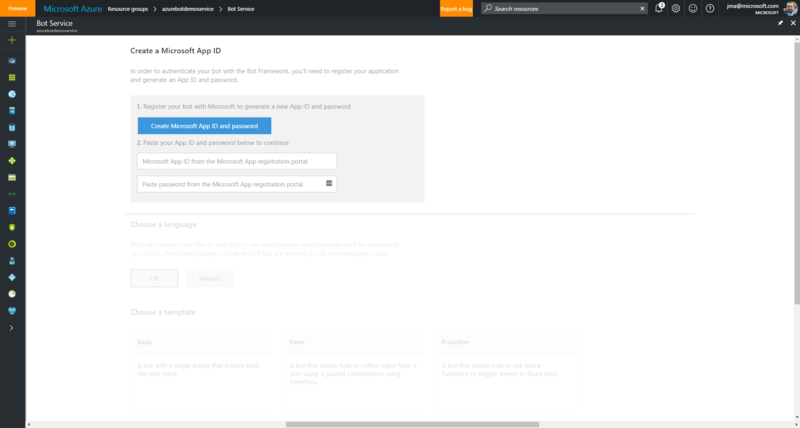 [Optional] Create an Azure Web App to host a simple page with the web chat embedded in it. I’ve built mine to have learned from the CSP FAQ. In theory, any of the questions there should get an answer from the chatbot. My next task is to go through and re-train the chatbot to understand more “natural” questioning, and of course, add more question-and-answer pairs to make it even more useful! If you’ve got an existing FAQ page / pages that you want to include as part of creating the bot then you can list them out in the form. This saves a huge amount of time and means you have a great starting point from which to train your chatbot. You can also upload up to 5 files to the service if you have them stored in a .tsv, .pdf, .doc, or .docx format. After creating the bot, you’ll be able to view all the question & answer pairs that have been detected. This view below shows the ones picked up from the CSP FAQ page. There are over 200 pairs! It’s here that you can remove any questions that you don’t need, add extra ones, re-word any answers and change the question language to be more “natural”. Once you’re happy with the questions you can click “Test” (on the left side of the screen) to start interacting with your bot! 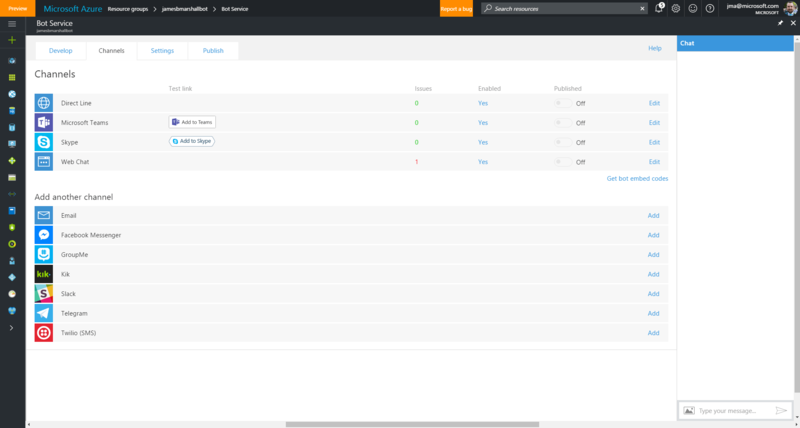 The interface is quite intuitive and you can make edits to questions and answers on the fly. I found this particularly useful as I’d type questions in a “real life” fashion, and if I didn’t get the answer I was expecting I could correct it immediately. Just remember to click “Save and retrain” to implement your changes! 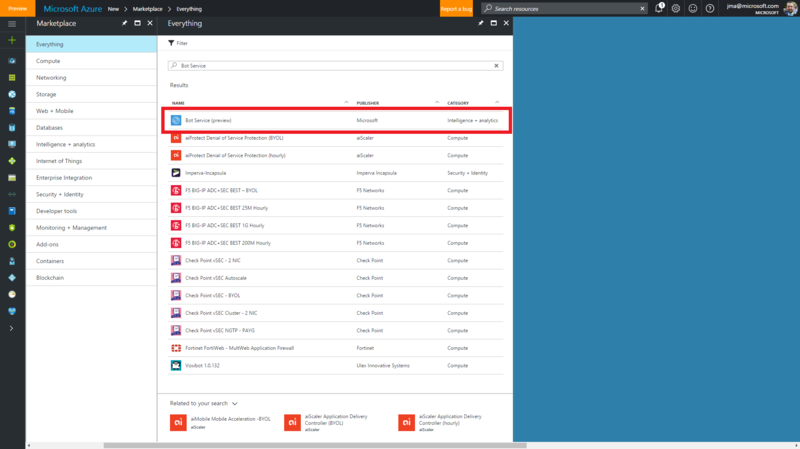 Follow the wizard to create the service, noting that you can add it to an existing Resource Group or create a new one. Once provisioned, navigate to the chatbot service where you’ll see that you need to configure your App ID unique keys. Again, follow the guides here - they’re very simple and just involve some copy and pasting into the right window. I’m not sure why this isn’t simpler, but I’m sure in time this won’t be such a faff! Once you’ve configured your App ID you’ll find the greyed out content activated and you’ll want to select “Question and Answer” from the array of options. Since I’ve already built my chatbot, a number of channels are already activated. It’s in this section that you can select which channels you want, and turn them on or off as required. You don’t actually need to publish your chatbot to start interacting with it through your favourite channels. If you just want the chatbot for private or internal use then you can leave it unpublished; however, if you want it for public access, listing in directories etc. then it’ll need to be subject to a quick review by Microsoft to ensure it meets the review guidelines. 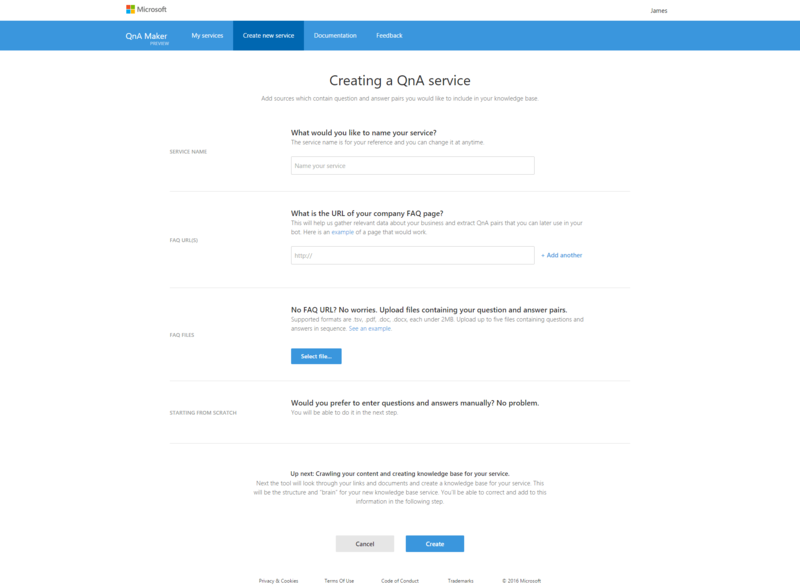 Create Bot from FAQ page with no coding - a little light on detail, but the last step helped me make the bridge between QnA Maker and Azure Bot Service.